The Big Idea: Sibling relationships often mean big feelings that can cause conflict and difficult behavior, but there a lot of ways kids can work through them without harming each other! Print out the page and help kids complete it. 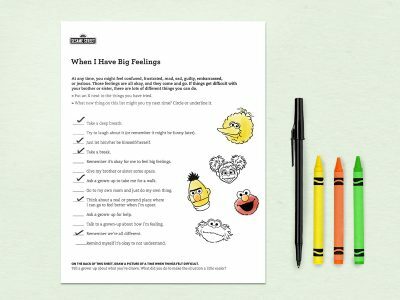 Talk about the tough feelings that might come up between siblings—like anger, frustration, jealousy, and impatience—and encourage children to remember times when they’ve felt these feelings. What did they do? Invite them to draw a picture on the back of the page. Tell kids, “When you feel like you need to calm down, there’s a fun way to do it. It’s called belly breathing. Let’s practice it!” Have kids put their hands on their tummies. Say, “Now we’re going to take a deep breath. Try to fill your stomach like a big balloon.” Then ask them to let all the air out slowly. Next time siblings struggle, remind them to try belly breathing.